A wide red stripe at the center, bordered by a narrow white stripe both above and below, followed by a blue stripe. The central red stripe carries a five-pointed red star within a white circle near the hoist. The flag of North Korea, also known as the Ramhongsaek Konghwagukgi (Korean: 람홍색공화국기; literally "blue and red-colored flag of the republic"), consists of a central red panel, bordered both above and below by a narrow white stripe and a broad blue stripe. The central red panel bears a five-pointed red star within a white circle near the hoist. This flag is banned from public use in South Korea due to its association with the ruling regime although some exceptions for the usage of the flag exist. "The national flag of the Democratic People's Republic of Korea consists of a central red panel, bordered both above and below by a narrow white stripe and a broad blue stripe. The central red panel bears a five-pointed red star within a white circle near the hoist. The ratio of the width to the length is 1:2." The North Korean flag's prominent motif is a red star, which is a universal symbol of communism and socialism, although since the flag's adoption, the application of the Marxist-Leninist-natured philosophy of Juche has replaced communist authority as the state's guiding ideology, and references to communism have been systematically removed from the country's constitution and legal documents. However, the constitution is still stated to be socialist in nature. Despite the many changes to the constitution, the description of the flag has always remained the same. The website of the pro-North Korean "Korean Friendship Association" indicates that, on the contrary, the red star represents revolutionary traditions and the red panel is indicative of the patriotism and determination of the Korean people. The white stripes symbolize the unity of the Korean nation and its culture. The blue stripes represent the desire to fight for independence, peace, friendship, and international unity. The red colour of the flag symbolises the anti-Japanese fervour, the red blood shed by the Korean patriots and the invincible might of our people firmly united to support the Republic. The white colour symbolises the one bloodline, one land, one language, one culture of our monoethnic country, which lived in purity. And blue stands for the gallant visage of our people, symbolising the spirit of the Korean people fighting for world peace and progress. It is possible that the original designer of the flag had a vertical design in mind. In the vertically hoisted flag the blue stripes would symbolize the West Sea of Korea (Yellow Sea) and East Sea of Korea (Sea of Japan) surrounding the red Korean Peninsula that is illuminated by the communist star. The colors of the North Korean flag – red, white, and blue – are considered national colors and symbolize respectively: revolutionary traditions; purity, strength, and dignity; and sovereignty, peace, and friendship. According to Korea expert and scholar Brian Reynolds Myers, in North Korea, the flag of the Workers' Party of Korea and the KPA Supreme Commander's personal standard are treated with more reverence than the North Korean national flag, with the Supreme Commander's flag ranking highest among the three in terms of reverence. A portrait of Kim Il-sung and the Taegukgi in 1948. The flag was also used in the North before the division. In the late 19th and early 20th centuries, the Korean Peninsula was ruled by a monarchy known as the Korean Empire. During this time, the Korean monarchy used a flag now known as the Taegukgi as its national flag. It featured a yin-yang symbol surrounded by four trigrams. The Taegukgi flag remained as the symbol of Korea after Imperial Japan occupied and annexed the Korean Peninsula in 1910. In 1945, World War II ended with an Allied victory and Japan was defeated. Per Allied terms, Japan relinquished its control over the Korean Peninsula, with the Soviet Union occupying the northern half of Korea and the U.S. occupying the southern half of it. The northern portion of the Korean Peninsula became a socialist republic supported by the Soviet Union following the restoration of independence of Korea in 1945, the Taegukgi was re-adopted there. In 1947 the Soviets communicated via Major General Nikolai Georgiyevich Lebedev [ru] to discuss whether the Taegukgi flag should be kept for newly founded North Korea. Vice Chairman of the Provisional People's Committee for North Korea Kim Tu-bong was in favor of keeping the Taegukgi. However, for Lebedev, the concept of Chinese philosophy, which the design of the Taegukgi based on, sounded like medieval superstition, so he wanted to change to a new flag. Kim yielded and a few months later the design for the new flag was dictated from Moscow, although it is not known who the Soviet official was that designed the flag. Before its formal adoption, the Taegukgi remained in official use. The design of the flag was disclosed, along with a draft constitution, on 1 May 1948. On 10 July 1948 the new flag was approved by the provisional People's Assembly of North Korea. 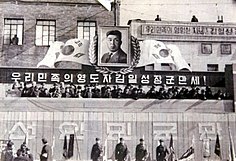 The following month Kim, who formerly supported the traditional design, wrote a reasoned text On the Establishing of the New National Flag and the Abolition of Taegukgi. Thereby he explained the decision to adopt a new flag against the wishes of those who favored the old one. In terms of North Korean official texts, Kim's account is unequivocally frank in acknowledging dissenting public opinion. In 1957, Kim Tu-bong was purged by Kim Il-sung who by that time had erected a cult of personality. Any mention of the use of Taegukgi was removed from texts and it was doctored out of photographs on the orders of Kim Il-sung who sought to monopolize North Korean history to serve him and his regime. Contemporary official North Korean accounts now posit that the new flag of North Korea as personally designed by Kim Il-sung. A 270-kilogram (600 lb) North Korean national flag flies from a tall flagpole, which is located at Kijŏng-dong, on the North Korean side of the Military Demarcation Line within the Korean Demilitarized Zone. The flag-pole is 160 meters (520 feet) tall. There are several other known flags to be in use in North Korea by its regime. There are flags for the Korean People's Army (KPA), and its two subdivisions the Korean People's Air Force and Korean People's Navy, which follow a common design but with different colors (blue and white for the North Korean navy and dark blue and light blue for the North Korean air force). There is also a flag of the ruling Workers' Party of Korea, modelled after similar communist party flags, and a flag for the Supreme Commander of the KPA used by Kim Jong-un, which has the Supreme Commander's arms on a red field. KPA Guards units use the same common design but with the national arms at the center of the obverse field. The flag of the Soviet Union, used in northern Korea during the Soviet occupation of northern Korea from October 1945 to September 1948. ^ a b c "Chapter VII, Article 170". Socialist Constitution of the Democratic People's Republic of Korea (PDF). Pyongyang: Foreign Languages Publishing House. 2014. ISBN 978-9946-0-1099-1 Amended and supplemented on April 1, Juche 102 (2013), at the Seventh Session of the Twelfth Supreme People's Assembly. ^ a b "North Korean Flag". web.archive.org. Archived from the original on 18 October 2014. Retrieved 2016-08-10. ^ "DPRK has quietly amended its Constitution". Leonid Petrov's KOREA VISION. Retrieved 10 August 2016. ^ a b Tertitskiy 2016, p. 270. ^ "Flag and emblem". Retrieved 31 March 2013. ^ a b c d e f Tertitskiy, Fyodor (20 June 2014). "Kim Tu Bong and the Flag of Great Extremes". Daily NK. Retrieved 10 August 2016. ^ "Korea, North". The World Factbook. Central Intelligence Agency. Retrieved 22 September 2015. ^ Obtained by Inkscape color values on ".svg" flag version. ^ Myers, Brian Reynolds (7 February 2018). "On the February 8 Parade and the Olympics". Sthele Press. Retrieved 9 February 2018. By forbearing to march behind the yin-yang flag at the opening ceremony of the Olympics, the South Korean athletes are making a bigger sacrifice than the North Koreans, in whose iconography the banner of the DPRK ranks lower than the party standard, which in turn ranks much lower than the Supreme Commander’s standard, the flag of the personality cult — something to which the North Korean athletes may end up paying homage anyway by wearing their leader badges. ^ Pringsheim, Klaus H. (1967). "North Korea Under the Hammer and Sickle: A Non-Marxist view". In Shaffer, Harry G. (ed.). The Communist World: Marxist and Non-Marxist Views. New York: Ardent Media. p. 439. OCLC 228608. Tertitskiy, Fyodor (August 2016). "Star and Stripes: History of the North Korean Flag and its Place in State Ideology" (PDF). Journal of Contemporary Korean Studies. 3 (1–2): 265–284. OCLC 6848975723. Wikimedia Commons has media related to Flags of North Korea. This page was last edited on 28 March 2019, at 23:46 (UTC).